We’d love your help. Let us know what’s wrong with this preview of Help Fund my Robot Army!!! & Other Improbable Crowdfunding Projects by John Joseph Adams. HELP FUND MY ROBOT ARMY!!! is an anthology of science fiction/fantasy stories told in the form of fictional crowdfunding project pitches, using t If you’re a regular backer of Kickstarters, you’ve probably seen some unique crowdfunding projects in your time. But one thing all of those campaigns—boringly!—had in common was: They abided by the physical laws of the universe! 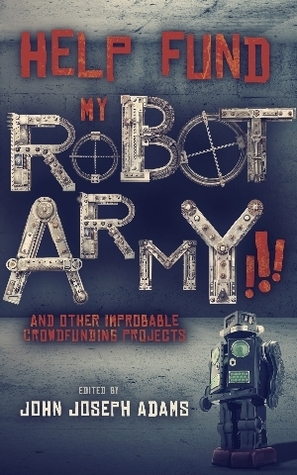 To ask other readers questions about Help Fund my Robot Army!!! & Other Improbable Crowdfunding Projects, please sign up. Will there be a trade paperback edition of this book? I'd happily get it on Kindle if there won't be, but I don't want to get this as an eBook until I'm sure there won't be a hard copy release any time soon (I've got a lovely collection of John Joseph Adams paperbacks and I don't like to break the pattern - but I'm so impatient to read it!). Michael I don't want to speak for John Joseph, but I am one of the contributors to this work and I've not heard of any plans for a printed release. Writing a story in the form of a Kickstarter page is a genius idea to begin with, and that idea was Keffy R.M. Kehrli's. Putting together an entire anthology of such ideas was John Joseph Adams's genius idea, as well as crowdfunding it via Kickstarter because duh. HELP FUND MY ROBOT ARMY!!! and Other Improbable Crowdfunding Projects contains over thirty fictional Kickstarters of the SFF persuasion (you'll find nothing as adorably mundane as a grandmother making canes here). As in any themed antho Writing a story in the form of a Kickstarter page is a genius idea to begin with, and that idea was Keffy R.M. Kehrli's. Putting together an entire anthology of such ideas was John Joseph Adams's genius idea, as well as crowdfunding it via Kickstarter because duh. HELP FUND MY ROBOT ARMY!!! and Other Improbable Crowdfunding Projects contains over thirty fictional Kickstarters of the SFF persuasion (you'll find nothing as adorably mundane as a grandmother making canes here). As in any themed anthology, the challenge is for each story to be fresh, embracing the theme while not being constrained by it. The book contains a fairly good mix of tones, topics, and narratives. The majority of stories follow the traditional Kickstarter page design, which provides a familiar and intriguing structure. (Maurice Broaddus, however, cleverly sets "I Used to Love H.E.R." in 2005, pre-Kickstarter, but still follows the basic format.) As anyone who's visited a Kickstarter page knows, the most prominent and visible feature (next to the video, if there is one—and some writers do manage to incorporate the Kickstarter video into the text) is the set of three magic numbers: backers, funding, and days left. Thus, at the beginning of the story, you know the outcome of the Kickstarter. Did it fund? Did it overfund wildly? Was it canceled? Perhaps it's still ongoing. This information is relevant and important and influences how you read the rest of the story. For instance, in Mary Robinette Kowal's hilarious "Zero-G R&J," we know that the project is successful, so when it appears to hit a giant speed bump, we want to know how it recovers. After the numbers comes the pitch, the heart of the project: who is running it, what are they trying to do, and why are they trying to do it? Some of these pitches are almost like flash fiction in and of themselves, providing the creator's backstory. Carmen Maria Machado's "Help Me Follow My Sister into the Land of the Dead" is a perfect example, as it saves the "why" until the very last sentence of the pitch, which makes a silly title not so silly anymore. Authors also play with the pledges, the FAQ, the Risks and Challenges, and especially the Updates and Comments, which is often where the real story happens, as these features allow a passage of time. I can't mention Updates without mentioning Vylar Kaftan and Shannon Pricket's wonderful "Updates," which playfully mocks Kickstarters seemingly obsessed with sending frequent, useless updates. Some of the stories in the anthology might not be considered "stories." Even the titular tale, though very funny, doesn't really have a plot, per se. That's not a knock, however: Kat Howard's "Locally Grown, Organic" doesn't really have a plot either, but it's funny, satirical, politically relevant, and ultimately devastating. I loved seeing how many different ways authors used this format to tell stories. Many hide plot twists in the Updates and Comments; as the creator engages with the backers, someone from their past appears and reveals key backstory. Sometimes the Updates chronicle the success or failure of the project in an unexpected way. And with each new story, you never know what kind of story you're going to get: will it be funny, sad, or a bit of both? Jake Kerr's "A Memorial to the Patriots" made me tear up, and I didn't think a fictional Kickstarter could do that to me. It wasn't the last one to affect my emotions, though. Every story didn't grab me completely, and some left me scratching my head as to what the truth of the matter was, but because each story is so short, weaker pieces have far less negative impact. And even those had elements I liked, even if they didn't all come together; there was no story I disliked. A collection of stories written as kickstarter style campaigns. The book is actually more fun and creative than it sounds with several of the stories making me laugh out loud and one or two evoking other feelings as well. The joke and concept wears a bit thin though and this might have been partly because of extra content from it exceeding its funding requirement but it did feel like there were more stories in the collection than there needed to be. Normally this would be a silly critisism of a A collection of stories written as kickstarter style campaigns. The book is actually more fun and creative than it sounds with several of the stories making me laugh out loud and one or two evoking other feelings as well. The joke and concept wears a bit thin though and this might have been partly because of extra content from it exceeding its funding requirement but it did feel like there were more stories in the collection than there needed to be. Normally this would be a silly critisism of a collection as if you dont like a story or want there to be fewer just dont read them all but in this one where it was unclear which writers would and wouldnt be able to rise to the challenge of doing something funny, original or ideally both with the format it was hard to know which ones to read and which to skip. The other problems are simply it is hard for the fictional to be more interesting than the real as crowdfunding is in its early stages of evolution. It is interesting and amusing to see some projects get huge amounts of funding (the potato salads of the world) and also to see how some projects engage or fail to engage with their potential backers - when all this is fictionalised it often ends up being less interesting. Also the format is very restrictive and often really good writers were only able to produce something bland that didnt stand out from the others. The story that launched the collection is quite good and is worth reading here or in Lightspeed and there are some good stories in here but often they failed to be as funny or meaningful as they wanted to be. I do not see the fault with the editor here - he managed to get a diverse and potentially interesting range of writers to work on the concept and equally they did a solid and sometimes very effective job of writing the stories - ultimately though the concept was not enough to hold together and entertain fully over the course of the book. "I just read "For Entertainment Purposes Only" by Jeremiah Tolbert this afternoon and it of course made me smile, which was just what I wanted to happen. I have to say that the comments are brilliant. "I want to be a Lioness" by Chuck Wendig: I quite liked this story. The comment section was used really effectively. It reminded me of "if you were a dinosaur my love". "Help Summon the Most Holy Folded One!" by Harry Connolly: This was a truly silly story but also a quite entertaining one about Tacos and about wanting to be right. Once again the comment section has been used to great effect. There are a handful of five-star stories in this book. There are also several rather pedestrian and repetitive stories in this book. They're not all funny, though comedy is overwhelmingly the M.O. One of the best—maybe even the best—of the stories is not comedy at all. Was definitely worth the 99¢ I paid. TL;DR version: Read the stories by Connolly, Cook, Williamson, Penn Romine, Sullivan, Levine, Broaddus, Wrigley, Bolander, and McGuire. SKIP the ones by Tolbert, Pratt, and Howard and your life will be better for it. For the rest, your mileage may vary depending on your own personal obsessions and expectations. Overall, though those ten stories that make the must read cut are well worth the $5 for this collection. Full review: Short story is a difficult art. To paint a world and its characters an TL;DR version: Read the stories by Connolly, Cook, Williamson, Penn Romine, Sullivan, Levine, Broaddus, Wrigley, Bolander, and McGuire. SKIP the ones by Tolbert, Pratt, and Howard and your life will be better for it. For the rest, your mileage may vary depending on your own personal obsessions and expectations. Overall, though those ten stories that make the must read cut are well worth the $5 for this collection. Full review: Short story is a difficult art. To paint a world and its characters and deliver the actual story in just a few pages is, to me at least, perhaps the height of the storyteller's art. The trick in this anthology is to restrain the form of the story to a Kickstarter proposal (along with comments from the denizens of the Internet and updates from the creator as appropriate. (Some of the proposals are only proposals and some are fully funded with updates from their aftermath.) This is like haiku, the required form either pushing the authors to achieve more with less. Of course, like bad haiku, when these stories fail, they all run together into a blur with nothing to distinguish them. This is made more noticeable by the fact that the form seems to have suggested a number of very similar themes to the authors. HELP FUND MY ROBOT ARMY!!! by Keffy R.M. Kehrli★★★☆☆. This is the story that sparked the anthology, so the innovation here is the form itself. (I bumped it up a star.) Otherwise, meh. ZERO G R&J by Mary Robinette Kowal ★★★☆☆ The story is the battle to get Romeo and Juliet (in space! with puppets!) funded. I was so ready to call this two stars, but it actually did make me laugh. A MEMORIAL TO THE PATRIOTS by Jake Kerr ★★★☆☆ There is the germ of a really good story here, but the constraints of the form got to this one. I never really had that "Aha!" moment that made clear what actually happened, and the confusion wasn't necessarily good. But, fog of war, and all that. USA post terror attack with a funding drive that may or may not be related. I WANT TO BE A LIONESS by Chuck Wendig ★★★★☆ A mother, her revenge, and the aftermath. LIBERTY:SEEKING SUPPORT FOR A WRIT OF HABEAS CORPUS FOR A NON-HUMAN BEING by Samuel Peralta ★★★★★. It is a little heavy handed on the last line, but this is the first story in the anthology that spoke poetry to me. An android needs help. HELP SUMMON THE MOST HOLY FOLDED ONE! by Harry Connolly ★★★★☆. Cthulhu via taco truck. Fun. FULFILL MY DESTINY - AND SAVE THE WORLD! by Matt Forbeck ★★☆☆☆ The first of three timetravel stories herein. Meh. LARPING THE APOCALYPSE 2: THE NANO-PLAGUE by Tim Pratt ★☆☆☆☆. Revenge of the geeks, apocalypse style. Annoying due to failed attempt to grapple with sexism in the gamer community. CATASSASSINS! by Veronica Belmont ★★★☆☆ See title. Kind of meh, but even more that the taco truck story succeeds in suggesting people ought to be careful what they fund, for their own personal safety. FINDER OF LOST THINGS by Monte Cook ★★★★★ Now here is a geek story done right. Charming, touching, and beautiful. PRIMA NOCTA DETECTIVE AGENCY NEEDS YOU by Genevieve Valentine ★☆☆☆☆ I actually had to reread this one to remember it and the reread did not help. The first of three vampire related fund drives. SO JUICY TRANSFORMING STRIPS by Matt Williamson ★★★★☆ What the hell was that? I still don't even know. Medical issues following worldwide environmental crisis? Some kind of zombie story? Just read this. THE SPIRIT OF MARS: FUND A SACRED JOURNEY TO THE RED PLANET by Andrew Penn Romine ★★★★☆ Another WTH? story, this time on a pilgrimage to Mars. Shaky on the take off, great on the end. FLASHED FORWARD by Bradley Beaulieu ★★★★☆ Beautiful time travel story. HELP ME FOLLOW MY SISTER INTO THE LAND OF THE DEAD by Carmen Maria Machado ★★★★★ See title. Maybe the best story in the anthology. Well worth the read. BE CAREFUL WHAT YOU WISH FOR by Michael J Sullivan ★★★★★ Awesome continuation of The Monkey's Paw. A PRACTICAL MECHANISM FOR OVERCOMING THE DIRECTIONALITY OF TEMPORAL FLOW by David D. Levine ★★★★★ The aftermath of a successfully funded time travel project. The story depends on the shifting details of the fund drive (which first seem like typos) to unfold the story. Very nicely done. LIFE-SIZED ARENA TETRIS! by David Malki ! ★★☆☆☆ More geek angst, but pointless this time. ZIPPERS by Derek Van Gorder ★★☆☆☆ Mind control via Internet, with kitten pictures, but otherwise meh. I USED TO LOVE H.E.R. by Maurice Broaddus ★★★★★ Frankenstein from the perspective of a black lesbian scientist. Set in 2005, prior to Kickstarter, so it plays out in the newspaper. Loved. Gut punch of an ending, though. LOCALLY GROWN, ORGANIC by Kat Howard ★☆☆☆☆ If I could give this negative stars I would. Elitist, sexist attempt to recreate A Modest Proposal. Stick with Swift. LET'S KEEP BURT GRIMSBY'S HEAD FROZEN! by Heather Lindsley ★★☆☆☆ Pointless. And I hate Disney most days, so that's not the issue. HELP ME DESTROY CANNES! by Jonathan L. Howard ★★☆☆☆ Destroying Cannes maybe sounds like fun, but super meh story. SAVE THE PHOTOPHOBIC HEMOGLOBIVORES WITH THE SANGUINE RESERVE! by Mur Lafferty ★★☆☆☆ Vampires manipulating folks, as they do. Meh. NOSFERATU, BRUTUS? by Scott Sigler ★★★☆☆ Why are vampires so hard to do in this format? Destroying the sparkly ones sounds great to me, so this should have been a lot of fun, but the project fails to fund so we don't get any aftermath. The writing is solid. I'm rounding up. I may check out Sigler's books. UPDATES by Vylar Kaftan and Shannon Prickett ★★☆☆☆ The stupid of the masses is a popular theme in this collection, but this is giant meh. YOU ONLY LIVE ONCE by Sylvia Spruck Wrigley ★★★★☆ Second space journey, better stupid of the masses. I kind of though meh when I first read it, but it has grown on me. MECHANICAL ANIMALS by Brooke Bolander ★★★★★ I can't classify this one without spoiling it. Being able to deliver this kind of characterization in this short of a story is a kind of magic I wish I could do. Read it. KISMET(TM) by Daniel H. Wilson ★★☆☆☆ Augmented consciousness. The project is funded, but no updates follow. (Don't you just hate that?) Meh. BRING ABOUT THE HALLOWEEN ETERNAL!!! by Seanan McGuire ★★★★☆ (Full disclosure, I bought this anthology to feed my addiction to McGuire's short stories.) Best "summon our own destruction" story in the collection, but none of the weight I love this author for to be found here. Still, pure sugar and fun with a side of end of the world, as befits Halloween. Básicamente escogí este libro porque el titulo me llamó la atención y no me he arrepentido. He tenido malas experiencias con otras antologías porque los relatos eran muy diferentes en términos de estilo y a veces calidad. Aquí no pasa. Los relatos están formateados como si estuviéramos leyendo un proyecto de crowdfunding y los autores utilizan los diferentes elementos para contar sus historias, eso hace que los cambios de estilo no sean muy grandes. Me parece un concepto muy interesante el limit Básicamente escogí este libro porque el titulo me llamó la atención y no me he arrepentido. He tenido malas experiencias con otras antologías porque los relatos eran muy diferentes en términos de estilo y a veces calidad. Aquí no pasa. Los relatos están formateados como si estuviéramos leyendo un proyecto de crowdfunding y los autores utilizan los diferentes elementos para contar sus historias, eso hace que los cambios de estilo no sean muy grandes. Me parece un concepto muy interesante el limitar las opciones del escritor a la hora de contar la historia y lo mejor de todo es que muchas de las historias funcionan bien precisamente gracias al formato. De lo que nos encontramos dentro hay temática muy variada pero se puede agrupar en cuatro categorías: factor wtf; devuélveme a mi amado/a; dominemos el mundo y distopía cientifico-empresarial. What a fantastic collection of "stories"! This book has a very specific target audience - namely those who have at least some experience with crowdfunding (especially Kickstarter). Those who do not will probably not "get" the format of the stories, or they will at least not work too well for them. However, if you are part of the target audience, then GO READ THIS BOOK! Especially if you have backed a dozen or more crowdfunding projects. It is THAT GOOD. There are hilarious, weird, disturbing, and What a fantastic collection of "stories"! There are hilarious, weird, disturbing, and really sad stories in here. The title makes it seem like it being a funny book, and the stories meant to be funny really are. But don't expect them all to be (not even most). All of them are very well-crafted, though, and either really entertaining or thought-provoking. I LOVED this. Great concept, fun realization of said concept and a really high quality of work overall. Obviously every single anthology has ups and downs in terms of quality, but this one managed a (generally) consistent high that was really pleasing to me. Favourite(s): Seanan McGuire's take on a halloween kickstarter was fun as hell, Mary Robinette Kowal's Romeo and Juliet in Space (with puppets) made me laugh hysterically and then force my fiance to read it so he could laugh hysterically too, I LOVED this. Great concept, fun realization of said concept and a really high quality of work overall. Obviously every single anthology has ups and downs in terms of quality, but this one managed a (generally) consistent high that was really pleasing to me. Favourite(s): Seanan McGuire's take on a halloween kickstarter was fun as hell, Mary Robinette Kowal's Romeo and Juliet in Space (with puppets) made me laugh hysterically and then force my fiance to read it so he could laugh hysterically too, Genevieve Valentine's take on a noir/urban fantasy detective was pitch perfect and Carmen Maria Machado's story about separated sisters made me ugly sob in the best possible way. Least favourite(s): The title story was fun but one of the wobblier ones, and while Samuel Peralta's story was good it's a concept that's been done (far better) before and also didn't really seem to get the brief. Many of the stories in this collection are very clever, many are funny, a few are poignant. However, the restrictions of the crowd sourcing format and subject matter makes them all seem slight and of a sameness. It's a little bit like having whipped cream for dinner. I suspect these stories would have done better mixed in a more heterogeneous anthology. The Seanan McGuire story did stand out though. Though the premise is cute about half way through it begins to wear thin and become a bit monotonous which is probably why they tried to throw some of the bigger authors and better stories (Scott Sigler) into the second half. I seem to always find anthologies a bit of a mixed bag and almost all of the ideas here arent bad but the premise does grate after awhile. This was my "on my phone" book. I only read it if I was stuck someplace with out anything to do (waiting rooms, trains, etc.). Tons of short little stories, an awesome way or writing them. Many were very funny, some bitter sweet, some horrific. Great collection all around. Some were fun but after the first few the novelty wears off. I liked many of the stories. Some were quirky, others played with the format in creative ways. After a few, though, it began to feel repetitive. So Juicy Transforming Strips is the b.e.s.t story! Hilarious and flabbergasting. Some others I liked: LARPing, Halloween, Taphognosis, Mechanical Animals, YOLO. A collection of funny, serious, creepy, crawly and cheeky stories based on imaginary kick starter projects. There are 33 stories in this anthology and the majority of them are written by accomplished (to a greater or lesser degree) authors in the sci-fi/spec fiction realm. Every single one of them follows the format of a Kickstarter crowdfunding pitch and while some others who have reviewed this collection on Goodreads mentioned that this format quickly got stale for them, I didn’t share that feeling as I was reading. In fact, I quite enjoyed seeing how so many different authors worked within the same – pretty limiting – restrictions to produce some very engaging stories. The collection includes tales from the sci-fi, speculative and fantasy genres but there are a few recurring themes in the bunch. There are a number of pitches dealing with time travel, quite a few robot-related stories, a couple to do with granting wishes and desires. While the repetition in format didn’t put me off any, the repetition of themes did in some cases. For instance there are two stories that are very similar in that they relate to pitches concerned with raising enough dosh to raise certain ancient deities. I enjoyed (and chuckled repeatedly) at Help Summon The Most Holy Folded One! by Harry Connolly but was a bit so-so towards Bring About the Halloween Eternal! by Seanan McGuire, which featured at the close of the collection and had a very similar tone and plot to Connolly’s tale. Similarly, I was less enthused by each time-travel tale that I encountered and I felt that the selection process for the stories could have been tighter to avoid including tales that were very similar. There’s a lot of humour going on in these stories (especially in some of the “comment threads”) and I particularly enjoyed Save the Photophobic Hemoglobivores with the Sanguine Reserve by Mur Lafferty, about creating a retreat for endangered vampires, Life Sized Arena Tetris! by David Malki!, whose title is self-explanatory (and a cracker of an idea in my opinion), and of course, the aforementioned Help Summon the Most Holy Folded One!, about the attempted raising of an ancient taco deity. But not all the pitches are included for comic relief. There’s the subtly sinister dystopian A Memorial to the Patriots by Jake Kerr, the touching plea of a mother in crisis, I Want to Be a Lioness by Chuck Wendig, the slightly bizarre medical breakthrough of So Juicy Transforming Strips by Matt Williamson and the bittersweet sting of grief unprocessed in Jerome 3.0 by Jason Gurley. Be Careful What You Wish For by Michael J. Sullivan has inspired me to seek out W. W. Jacob’s original story, The Monkey’s Paw (another one for the mountainous TBR pile – at least it’s a short story) and, ironically, Spoilerfree: A Device for 21st Century Entertainment Living by Jeremiah Tolbert has lodged in my brain as one of the most memorable (and devilishly cheeky!) stories in the group. This mixed-bag of an anthology would honestly get a 3.5 from me, if I could give a half star. Real shame, too, considering this project assembled some world class writers to a simple theme -- make up a wild or fantastic kickstarter. "I WANT TO BE A LIONESS" -- I really, real This mixed-bag of an anthology would honestly get a 3.5 from me, if I could give a half star. Real shame, too, considering this project assembled some world class writers to a simple theme -- make up a wild or fantastic kickstarter. "I WANT TO BE A LIONESS" -- I really, really liked this one. It could've been silly, but the author went for genuine emotion and desperation. "SAVE THE PHOTOPHOBIC HEMOGLOBIVORES WITH THE SANGUINE RESERVE" -- Maybe I just like this because it's miles better than the other vampire story in this collection, "NOSFERATU, BRUTUS? ", but the subtle wordings in the rewards and updates cracked me up. "LIFE-SIZED ARENA TETRIS" -- I honestly didn't think I was going to like this one, but the twist at the end has all the good awkwardness you'd find in comments sections across the internet. "ZERO-G R&J" -- Ok, I was at first a little miffed by the author inserting herself in the story, but she won me over with a fun and kinda believable story of disasters that could happen to a puppet show of Romeo & Juliet in outer space, starring David Tennant. First, some of the stories were good stories but very awkwardly shoe-horned into the Kickstarter format ("I Used To Love H.E.R." comes to mind, barely meeting the crowd-funding format and generally abusing the epistolary format at the climax). Then there were stories that were oppressively corny and made me roll my eyes more often than laugh -- sadly, the eponymous story of this collection, "HELP FUND MY ROBOT ARMY," falls in this category, as well as a fairly lame Buffy The Vampire/supernatural noir spoof, "PRIMA NOCTA DETECTIVE AGENCY NEEDS YOU." But the real cardinal sin of this collection was too many stories on either the same shtick (so...so many stories about time travel or uploading people into robots) or the same plot arc (Description:"Here's A Cool Thing! ", Comments:"This isn't going to end well," Update 1:"Boo Naysayers, we're funded! ", Update 2: "My God, What have we done?!"). The predictability really kills the fun of reading this anthology. I don't usually read anthologies. The main reason is when I do grab them it's because there is one, maybe two, authors participating who I know/like. I end up enjoying their stories (maybe) and hating the rest, closing the book at the end feeling a tad cheated. I feared this book would be no different. I picked it up because Chuck Wendig used his mind powers and convinced me to try it. Once I owned it, however, I noted that not only had he participated, but other writers I like - Mur Lafferty (Sh I don't usually read anthologies. The main reason is when I do grab them it's because there is one, maybe two, authors participating who I know/like. I end up enjoying their stories (maybe) and hating the rest, closing the book at the end feeling a tad cheated. I feared this book would be no different. I picked it up because Chuck Wendig used his mind powers and convinced me to try it. Once I owned it, however, I noted that not only had he participated, but other writers I like - Mur Lafferty (Shambling Guides), Michael J. Sullivan (Riyria Revelations), Jonathan L. Howard (Johannes Cabal series) and Monte Cook (game writer) added their unique takes on the theme. As you might expect, there were stories that didn't appeal to me, but for the most part the tales were clever and diverse. I actually think Jeremiah Tolbert's "For Entertainment Purposes Only" grabbed me the most. Now, to be clear, if you decide to pick up this book, be prepared for it to not follow the usual rules for a collection of short stories. The items included are intended to mimic the formatting and style of a Kickstarter call for cash project. The project starter outlines their goals, provides their qualifications, explains what the funds will be used for and admits to any issues they foresee hampering the project. After that they list all of the funding goals and this is usually followed by "comments" by viewers, like you would see in a forum setting. Some of the comments are the best part of the "stories". If you're thinking that all of the entries are done simply for laughs, that isn't the case. There are some sad and even disturbing stories. However, I would say that 75% of the offerings are meant to make the reader smile. And the fact that the project itself was made possible via a Kickstarter campaign, makes it all the more appealing for me. Maybe since it just seems so appropriate. I think there was a point last year where I decided that I should be seeking out more short fiction, which unfortunately got turned by my mind into "pick up any book that has more than one author and some cheap gimmick." The gimmick here is that each story is a kickstarter campaign, with a pitch, pledge rewards and comment sections to tell a tale. There's a few urban fantasy but mostly near-future SF. I started breaking down stories into a few categories: the Frankenstein story ("What could possi I think there was a point last year where I decided that I should be seeking out more short fiction, which unfortunately got turned by my mind into "pick up any book that has more than one author and some cheap gimmick." Interestingly, while plenty parody kickstarter and internet comments, there are only a few actual satires--one of my favorites, by Sylvia Spruck Wrigley, has some fun with the pro-space crowd. And given the medium I'm surprised none are a straight-up, this-is-a-cool-idea, pitch. Some other highlights include David Levine's story on time travel, which has some fun with the format itself, and Carmen Machado doing a sort of understated ghost story. This is a collection of short stories about people trying to get others to help them with a variety of science-fictional projects, from the titular robot army to the first writ of habeus corpus for a synthetic being to sending Mary Robinette Kowal and David Tennant into space long enough that they can perform _Romeo and Juliet_ with puppets. The gimmick here is that each of these stories is written in the form of a Kickstarter pitch. In his introduction, Adams says that the title piece came his This is a collection of short stories about people trying to get others to help them with a variety of science-fictional projects, from the titular robot army to the first writ of habeus corpus for a synthetic being to sending Mary Robinette Kowal and David Tennant into space long enough that they can perform _Romeo and Juliet_ with puppets. The gimmick here is that each of these stories is written in the form of a Kickstarter pitch. In his introduction, Adams says that the title piece came his way as a magazine submission, and he realized how much could be done with the format. So he bought the story for the magazine, then promptly put the anthology idea together. In recent years, Adams has become one of my favorite sf editors. He's prolific enough that I keep worrying if maybe he's stooped to shoveling together any ol' junk lying around, and the answer keeps being, no, this is another really good collection. No change this time around. Most of the stories are humorous, and made me smile, snort, laugh, and otherwise have a good time. But there are some serious pieces in here, too - that habeus corpus story is one of several that I found genuinely moving. There's also a good dosage of acidic satire, which makes a nice leaven in the mix. Given the format, of course, none of these is terribly long, either, so it's a great browse-and-read-for-a-few-minutes kind of volume. This book had some great points...and some not so great points. Some of the stories were excellent, and lent themselves really well to the KickStarter format. "Flashed Forward" by Bradley Beaulieu, for example, was an excellent and very enjoyable read, about a time traveler. I also really enjoyed Jake Kerr's "A Memorial to the Patriots" about terrorists in a big brother-esque United States. Both stories (and a few others) did a great job leading the reader through the world of their KickStarter This book had some great points...and some not so great points. Some of the stories were excellent, and lent themselves really well to the KickStarter format. "Flashed Forward" by Bradley Beaulieu, for example, was an excellent and very enjoyable read, about a time traveler. I also really enjoyed Jake Kerr's "A Memorial to the Patriots" about terrorists in a big brother-esque United States. Both stories (and a few others) did a great job leading the reader through the world of their KickStarter and delivered an emotional punch by the end. One of the weaker parts of the book, however, are that a lot of stories seem relatively cookie-cutter and have little to differentiate themselves one from the next. A few of the themes got relatively boring the 4th or 5th time you've read it, and the similarity in format for these stories that were only mildly differentiated from one another led to them being relatively boring. Writing a short story presents different challenges than a full-lenght novel, the main crux of it being the essential lenght constrains. But how about we also add a structural element to the obstacles? Say, the story has to be told in a certain manner, be it first-person, involving a fantastical invention or in the shape of a Kickstarter pitch. This innovative collection corresponds to the latter, obviously. As such, it's a hit-or-miss (mostly hits, mind you) collection of short stories, firmly s Writing a short story presents different challenges than a full-lenght novel, the main crux of it being the essential lenght constrains. But how about we also add a structural element to the obstacles? Say, the story has to be told in a certain manner, be it first-person, involving a fantastical invention or in the shape of a Kickstarter pitch. This innovative collection corresponds to the latter, obviously. As such, it's a hit-or-miss (mostly hits, mind you) collection of short stories, firmly set into a science-fiction mindset involving a wide range of narratives: from global corporations pitching to take over your life, exoplanet scams, time travel, alternate histories, divinities summoning, apocalypse seekers and more! Some stories do stand taller among the rest. My personal favorite, and the only one that really stuck with me afterwards, was "Flashed Forward" for it's poignant depiction of an old scientist pitching a machine that would allow him to travel forward in time... and it's powerful, unexpected ending. I think the title of the collection may skew a person's impressions of the types of stories that are found inside. I was expecting the tone of the book to be over all humorous. And while there are more than a few funny "projects" included, it ends up feeling nicely balanced by stories like Jake Kerr's "A Memorial to the Patriots" and Samuel Peralta's "Liberty: Seeking Support for a Writ of Habeas Corpus for a Non-Human Being". I would say that most of the stories included are really good. I there I think the title of the collection may skew a person's impressions of the types of stories that are found inside. I was expecting the tone of the book to be over all humorous. And while there are more than a few funny "projects" included, it ends up feeling nicely balanced by stories like Jake Kerr's "A Memorial to the Patriots" and Samuel Peralta's "Liberty: Seeking Support for a Writ of Habeas Corpus for a Non-Human Being". I would say that most of the stories included are really good. I there were a couple that I didn't really care for. One didn't seem like it was trying to be a self contained thing so much as a possible add for another work by the author. And one hit my personal pet peeve of "gobblefunk"-ing around with words (something that is only made worse in short fiction where your audience may not have the chance to adapt to your invented gibberish). Over all, I rather enjoyed the collection and was not disappointed. Adams has composed another great anthology, this time one that perfectly captures the spirit of well-run crowdfunding campaigns. The stories cross the spectrum of sci-fi subgenres and range from humorous to heart wrenching. Most of the stories have a humorous to satirical tone, but there are a few that veer into the tragic and serious. I found those to be both impactful and refreshing; they provided great balance in the context of the work overall. The stories themselves were great and provided t Adams has composed another great anthology, this time one that perfectly captures the spirit of well-run crowdfunding campaigns. The stories cross the spectrum of sci-fi subgenres and range from humorous to heart wrenching. Most of the stories have a humorous to satirical tone, but there are a few that veer into the tragic and serious. I found those to be both impactful and refreshing; they provided great balance in the context of the work overall. The stories themselves were great and provided their own variety of topics. From the titular robot army, to puppetry in space, to time travel or summoning elder gods, each tale captures the spirit and challenges of a crowd funding campaign. Even with the inherently short formats, the authors have clearly put in research to this style of project along with the topic they are actually presenting. This book emulates the Kickstarter text style so well! Definitely use default fonts when reading this, or you'll miss out on a good bit of the experience. The projects in this book range from something I'd be a bit interested in to straight up totalitarian and scary. But they're all there for a laugh. Even when the world they create is basically incompatible with human life, they're presented with such deadpan seriousness that it winds up being funny. And kudos to JJA for actually Kickstarting a This book emulates the Kickstarter text style so well! Definitely use default fonts when reading this, or you'll miss out on a good bit of the experience. The projects in this book range from something I'd be a bit interested in to straight up totalitarian and scary. But they're all there for a laugh. Even when the world they create is basically incompatible with human life, they're presented with such deadpan seriousness that it winds up being funny. And kudos to JJA for actually Kickstarting a book about SF kickstarter projects. Nice little touch. This is a brilliant and unusual take on the short-story anthology. In the words of the editor: "I came across a story by Keffy R.M. Kehrli called “HELP FUND MY ROBOT ARMY!! !” which was told in the form of a fictional Kickstarter pitch. My first thought when I read the story was: This story is really funny. My second thought was: I should build an anthology around it. My third thought was: Obviously the anthology should be published via a crowdfunding campaign." Show your support for arena Tetris, This is a brilliant and unusual take on the short-story anthology. In the words of the editor: "I came across a story by Keffy R.M. Kehrli called “HELP FUND MY ROBOT ARMY!! !” which was told in the form of a fictional Kickstarter pitch. My first thought when I read the story was: This story is really funny. My second thought was: I should build an anthology around it. My third thought was: Obviously the anthology should be published via a crowdfunding campaign." Show your support for arena Tetris, or destroying all sparkly vampires. Support a puppet show in space or help fund feline assassins. Un montón de historias puestas en formato KickStarter. Si es por innovación, este libro se lleva todos los premios. Mi principal problema con este libro es que es un libro mayormente de premisas, salvo unos pocos casos donde ocurre un poco de historia propiamente tal. Pero la mayor parte de los casos es un trozo de proyecto con ciencia ficción o fantasía no convencional, donde la venta está en los chistes. Después de un rato puede volverse repetitivo. El formato es muy interesante y hay historias Un montón de historias puestas en formato KickStarter. Si es por innovación, este libro se lleva todos los premios. Hit and miss, like many anthologies, but an enjoyable read all in all. My favourites were the stories by David D. Levine (ingenious) and Bradley Boulieu (heart rending). The format got old quite fast so I think in this case less (i.e., fewer stories) would have been more. However, the stories were short enough so if one didn't do it for me, I hadn't wasted too much time on it. Hm, this doesn't sound like a four-star review, but honestly, I had fun reading it. This Kickstarted anthology suffers from one flaw: the sheer number of stories that are told in the format of crowdfunding campaigns. It isn't that the tales are repetitive, but the format is so restrictive that after reading several in a row that the delight starts to fade. The same thing happens with flash fiction, so while I recommend this book as well, I would suggest you dip your toe in every so often rather than try to binge on it. This is a great anthology. These stories are so very creative, and the format is fantastic. Some stories are sad, some creepy and some will make you laugh out loud. My favorites are Liberty by Samuel Peralta, Zero G R&J by Mary Robinette Kowal and Jerome 3.0 by Jason Gurley. I love that anthologies give an opportunity to sample authors that I am not familiar with.